Shirt can become part of your everyday wardrobe by assisting you with the easy-to-use nursing bra. It features two fabric layers for extra coverage and a soft elastic band for support. The shirt covers your stomach while nursing and you don not need to wear a separate bra underneath. Great fit is important because the Soothe Shirt performs the best in supporting your baby and enabling breastfeeding when it fits well. As a new mom, every day you need an outfit to wear that you love, a nursing bra to breastfeed your little one, and a way to hold your baby close. Material: 71-80% cotton.Made of the best domestic and imported fabrics. Our premium fabric is custom-milled to be soft, secure and wrinkle-free. The Soothe Shirt can be worn in any season. The wearable fabric and fashionable design makes this tank top an easy "go-to" top for summer and works well with all the layering that will happen in spring, fall and even winter. Mom / Dad can easily comfort her newborn thanks to the secure yet expandable pouch creating an intimate swaddle right against mom / Dad . Only use the pouch for babies between 7 lbs. and 15 lbs. Never use the pouch with a premature baby until they reach 7 lbs. Do not use if baby is too long (pouch must cover infant's shoulders at all times). 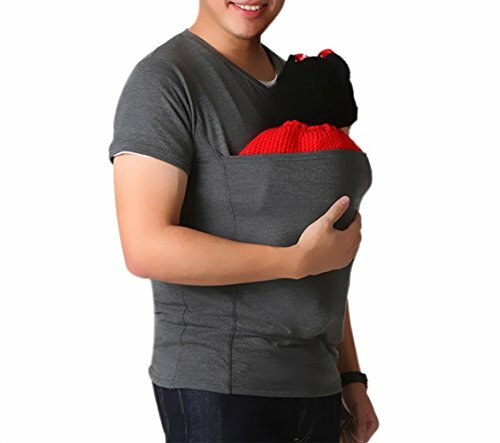 The shirt is not meant to carry your baby hands-free. Always have one or both of your hands supporting your baby's body while in the pouch. Always make sure baby's head is supported with the head support panel or your hand. If you have any questions about this product by M-Brave, contact us by completing and submitting the form below. If you are looking for a specif part number, please include it with your message.